So you’re flipping through your favourite magazine while lying on the sofa when a stunning picture grabs your attention. The glistening image shows a family of four taking full advantage of their welcoming beach terrace by sharing a meal and enjoying each other’s company. Suddenly you notice the beautiful Aluminium Shutters surrounding them. It’s the perfect accessory you think to yourself. It’s just the right blend of casual and sophisticated. Oh to hell with it you think, rushing over to your patio, you open the magazine one more time and while staring pensively at the image, you list off the reasons as to why you’re going to install shutters on your currently bland patio and open patio. We all deserve an all expenses tropical vacation, preferably for six months, twice a year. Sadly the world does not work like this, but it shouldn’t stop us from trying to make the most of our free time. Use shutters to create a comfortable outdoor entertainment area for you and your loved ones, which can be used all year round in all South African climates. 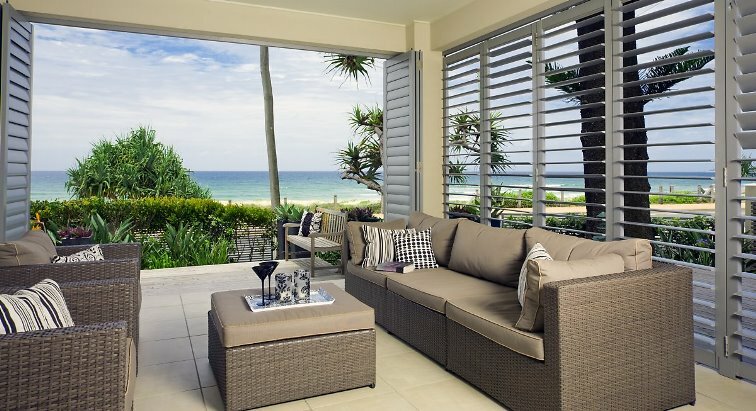 By installing Aluminium Shutters on the patio, you’re taking full advantage of your 24 hour days. Some might say you’re wasting money, but actually, you’re making an excellent investment. Installing shutters can increase the value of your home. Talk about killing two birds with one stone! The added security afforded by shutters is where the investment really comes in. Nobody deserves to have their privacy violated. You might be thinking there’s only so much you can do for your outdoor space, an electric gate and perhaps an alarm system here and there but did you know that shutters are an excellent way of protecting your valuable belongings from thieves? If you’re in the mood to curl up and read a good book without the fear of someone spotting you and scaring you, then just lock the doors in place and close the slats. This product is incredibly durable, so you don’t have to worry about it deteriorating over time, due to harsh weather conditions. If you feel for a bit of sunshine, open it slightly, and when cold, close it entirely, so you’re in a private, cosy environment. You will have full control over the space, irrespective of the external weather conditions. Don’t you just hate it when you get an idea in your head, but you’re unable to bring it to life because the store doesn’t have what you’re looking for or the application just won’t work? Aluminium Shutters are perfect as they can be customised to suit your lifestyle, space and to enclose tricky curved patios. Fitment is also a breeze with many different configurations possible. Make your patio dreams a reality this 2018. It’s not just aesthetically pleasing to the eye but holds many benefits. This entry was posted in Aluminium Shutters and tagged aluminium security shutters, Aluminium shutters, Shutter Supreme, Shutters.